How, I keep asking myself, have I missed this book for my entire adult life? It is everything I love in a book – it’s clever, witty, cheeky and just the tiniest bit sacrilegious. It’s irreverent, intelligent and laugh-out-loud funny. It seems like every one of my friends has not only read it but loved it. I feel like a science fiction fan who has somehow missed the entire enterprise that is Star Trek. 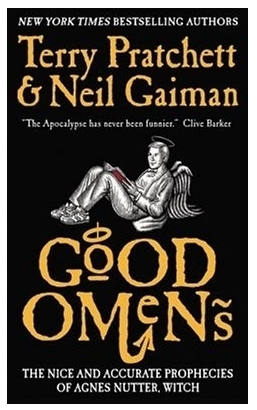 This book is Good Omens: The Nice and Accurate Prophecies of Agnes Nutter, Witch by Neil Gaiman and Terry Pratchett. I at least been aware of Neil Gaiman for years, and have been quite enjoying a few of his books for kids and for grownups over the last year or so. From Fortunately the Milk for the kids to The Ocean at the End of the Lane for me, I was happy to discover a quirky author whose work I had previously overlooked. I was a little less aware of Terry Pratchett – I knew his name, and loosely his genre, but thought he was more straight fantasy in the lines of George R R Martin or David Eddings. In fact, I think I had been confusing him with Terry Brooks, now that I think about it. As the boys and I started casting about for something to read after we finish the Anne of Green Gables series, Discworld tripped my radar and I realized that Terry Pratchett was revered on par with Douglas Adams for his witty irreverence. And to complete the mental loop, I had just last summer read Neil Gaiman’s biography of Douglas Adams called Don’t Panic. And so, I picked up Good Omens on a lark. I don’t often literally laugh out loud when I’m reading by myself, but this book had me doing just that. The book is, to do it complete injustice in the summary, loosely the story of an angel, a demon and the coming of Armageddon to a sleepy little English hamlet called Lower Tadfield. I have to admit, there was a bit early in the novel when I scratched my head and wondered where the hell all the various plot lines were going, but the humour kept me hooked. There was an early and ongoing bit of schtick about how “all tapes left in a car for more than about a fortnight metamorphose into ‘Best of Queen’ albums” that had me sniggering, and at least once a chapter I was laughing out loud and thinking to myself, “Self, you have really GOT to figure out how to turn on the highlighting and underlining thingee on the Kindle so you can mark some of these quotes for future reference. Crowley had always known that he would be around when the world ended, because he was immortal and wouldn’t have any alternative. But he hoped it was a long way off. Because he rather liked people. It was major failing in a demon. Oh, he did his best to make their short lives miserable, because that was his job, but nothing he could think up was half as bad as the stuff they thought up themselves. They seemed to have a talent for it. It was built into the design, somehow. They were born into a world that was against them in a thousand little ways, and then devoted most of their energies to making it worse. Over the years Crowley had found it increasingly difficult to find anything demonic to do which showed up against the natural background of generalized nastiness. There had been times, over the past millennium, when he’d felt like sending a message back Below saying, Look we may as well give up right now, we might as well shut down Dis and Pandemonium and everywhere and move up here, there’s nothing we can do to them that they don’t do to themselves and they do things we’ve never even thought of, often involving electrodes. They’ve got what we lack. They’ve got imagination. And electricity, of course. One of them had written it, hadn’t he…”Hell is empty, and all the devils are here.” Crowley got a commendation for the Spanish Inquisition. He had been in Spain then, mainly hanging around cantinas in the nicer parts, and hadn’t even known about it until the commendation arrived. He’d gone to have a look, and come back and got drunk for a week. ‘Well. You’re a girl,’ said one of the others. You might have heard that Sir Terry Pratchett died this past March, just a few weeks after I realized he was an author whose works I should have been reading since I was a teenager. We were discussing my late-to-the-party adoration of this book on Facebook and a friend shared this list of 50 great quotes from Terry Pratchett. I discovered one that has to be the new motto of anyone who works in social media for the government: “It’s not worth doing something unless someone, somewhere would much rather you weren’t doing it.” And this one, which came >this< close to being the new tag line for the blog: "If you don't turn your life into a story, you just become part of someone else's story" As another wise friend said, "Lucky for you, there's only about 50 more Pratchett books for you to discover. Sad for all of us, there will never be any more than that." I am still perplexed as to how I so utterly failed to notice this book before now. I'm delighted, though, that we have just a few chapters left to read in Anne of Ingleside, and then I can start reading The Colour of Money (aka Discworld #1) by Terry Pratchett with the boys. I think I may cue up a little Neil Gaiman for my own reading next. Where should I go? American Gods? Neverwhere? The Graveyard Book? Clearly I can no longer be left to my own devices when choosing books, or I would have read Good Omens 20+ years ago! Enlighten me, bloggy peeps – what ELSE have I been missing? Hello – I am a new reader of your blog. Although the author is new on the horizon, you will be among the FIRST to read his books rather than late in the game. He has also recently written My Grandmother Sent Me to Tell You She’s Sorry which I have on reserve at my library. Previous post: In which she utterly fails to adhere to the idea of moderation. Again.